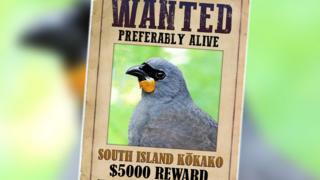 A cash reward is on offer in New Zealand for any sightings of a native bird that was until recently thought to be extinct. The South Island kokako - sometimes called the "grey ghost" - was declared extinct in 2007, but then reclassified as "data deficient" in 2013 following a number of reported sightings. Despite the change, there's been no definitive proof that any of the birds are still alive - and that's what the South Island Kokako Charitable Trust wants to find. "If South Island kokako still exist, there will be very few left," chairman Euan Kennedy tells Stuff.co.nz. "We need to locate them very soon so that conservation has a higher prospect of success." The trust is offering 5,000 New Zealand dollars (US$3,600; £2,900) for "definitive evidence of survival" - preferably a photograph - and is asking everyone to keep their eyes and ears open in the country's southern forests. The reward will be paid out once a panel of ornithologists has reviewed any evidence and concluded that the bird does still exist. The South Island kokako was once common but, as with so many of New Zealand's native birds, suffered greatly from the spread of introduced predators in the 19th Century. Anyone who thinks they've spotted or heard one can log the encounter online. Smaller than a pigeon, it looks similar to the North Island kokako but has an orange wattle rather than a blue one. Its flute-like call could be confused with some other species, so the Trust would prefer visual evidence, although it adds one important point: "Please do not shoot a bird to satisfy our requirements!"